Completing an oil painting on canvas can create pleasing textures as the paint skids over the canvas weave, allowing some of the underpainting to show through. However, the canvas’ ‘give’ might not always be desirable if control of the paint is vital. The canvas yields too much to the brush. How does the artist overcome the problem of a floppy canvas, and is there an alternative? Using fine sables to express delicate detail over coarse grain canvas. Painting on canvas that has not been stretched properly, for instance if kinks are evident. Painting on a canvas that has been insufficiently tensioned, causing the surface to yield too much to the brush. Insufficient crossbars at the back of the canvas, causing the fabric to sag in the middle. The artist opts for oil painting on a panel simply for the firm surface, but would still like to try out the canvas textures to attain certain effects. Not all artists like the ‘give’ in canvas whist painting. I myself prefer a firm surface on which to paint, particularly when it comes to control of the paint or when using vigorous brush marks. Even if the canvas were stretched to the limit with tensioners, the surface is insufficiently firm. However, there is a way around this problem, which could offer the artist more choice and save money. Gluing canvas onto a firm surface such as card or wood is simple and creates a canvas surface with no give. Certain art shops stock canvas-textured boards for those who wish to paint on canvas. However, these are not always easy to find and the artist could be restricted on choice. The good news is that if you do it yourself, you have complete control over the choice of canvas grain or for that matter, other suitable fabrics, which might be linen or cotton – a great way of exploring textures for painting. Canvas can be found in DIY stores as well as art shops, as it is also used for dust sheets or sacking. Other fabrics can be used for oil painting, such as cotton, linen or denim. Unsuitable fabrics are wool (too fibrous) or silk (too fine). 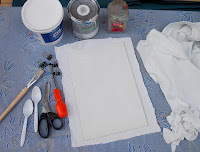 An old shirt, duvet-cover, pillow, curtain case or canvas dust sheet can be utilised for an oil painting surface so long as they are not brightly-coloured. The image above shows the materials needed for gluing canvas onto board, which are: suitable fabric, the chosen art surface, PVA glue, acrylic gesso primer, 2 household brushes and scissors. Prepare a firm surface for the oil painting, which might be hardboard, MDF or thick card. Cut the art surface into the desired size. Prime the art surface (if not primed) with acrylic gesso primer. Once the primed art surface is dry in an hour or so, cut the fabric/canvas around the art surface, allowing an inch on each side, so that it can be tucked around the back. Prepare the glue mix as follows, which should be sufficient quantity to cover the board twice-over. Bear in mind that textured fabric has a larger surface area than board, so ample solution will be needed. For the glue, I use good quality all-purpose PVA. PVA is a white, syrupy adherant that dries clear. To make it more stable when re-wet, I add a few spoonfuls of acrylic gesso to the glue in a separate container. Mix well and add a few drops of water to add flow. Add liberal amounts of the glue mixture onto the art surface and then lay the fabric squarely on top, pressing downwards and outwards, eradicating any trapped air. Brush outwards. Once the fabric has been firmly stuck down, add another layer of the glue mixture on top of the fabric, to provide extra sealant and to ensure the glue has permeated the fabric. Allow the glue mixture to soak into the fabric weave, but ensure an even, not too thick coverage. Affix bulldog clips to the corners of the artboard if necessary to keep the fabric in place. Allow to dry over a day or so. Once the glue has dried, tuck the fabric around the back and glue the surplus fabric onto the back of the board. Neaten edges by trimming exces. Once all the glue has dried, apply a layer of acrylic gesso primer onto the artboard, but don’t apply it too thickly or it will conceal the texture of the fabric. Once the primer is dry, in about a few hours, the canvas board is ready for oil painting. The artist does not have to paint on stretched canvas to enjoy the textures it yields. Canvas, linen or other suitable fabrics can be stretched over a firm surface such as board or panel. Glue and gesso primer will ensure the fabric sticks firmly and provides a suitable surface on which to oil paint. The artist can save money and gain more control over the choice of fabrics on offer.